These limited edition Lock Your Meds lapel pins are a great way to support the campaign to stop prescription drug abuse. It’s a beautiful symbol to promote awareness in your community or a perfect way to reward fundraising donors. Purchase these pins in batches of 50. If you need more than 500 pins, give us a call at 305-856-4886. 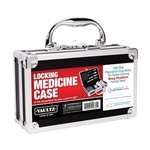 Packet of 50 Lock Your Meds Posters 12x18in.